Lev 23:2 Speak unto the children of Israel, and say unto them, Concerning the feasts of Yahweh, which ye shall proclaim to be holy convocations, even these are my feasts. Lev 23:3 Six days shall work be done: but the seventh day is the sabbath of rest, an holy convocation; ye shall do no work therein: it is the sabbath of Yahweh in all your dwellings. 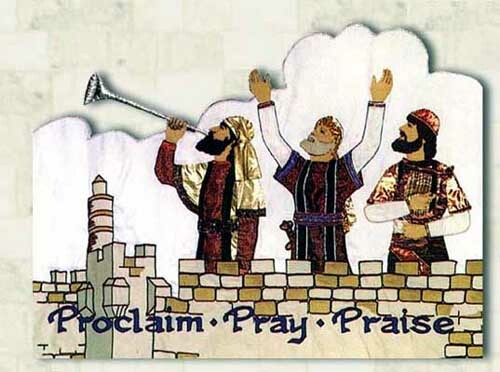 Lev 23:4 These are the feasts of Yahweh, even holy convocations, which ye shall proclaim in their seasons. Lev 23:5 In the fourteenth day of the first month at even is Yahweh's passover. Lev 23:6 And on the fifteenth day of the same month is the feast of unleavened bread unto Yahweh: seven days ye must eat unleavened bread. Lev 23:8 But ye shall offer an offering made by fire unto Yahweh seven days: in the seventh day is an holy convocation: ye shall do no servile work therein. Lev 23:11 And he shall wave the sheaf before Yahweh, to be accepted for you: on the morrow after the sabbath the priest shall wave it. Lev 23:12 And ye shall offer that day when ye wave the sheaf an he lamb without blemish of the first year for a burnt offering unto Yahweh. Lev 23:13 And the meat offering thereof shall be two tenth deals of fine flour mingled with oil, an offering made by fire unto Yahweh for a sweet savour: and the drink offering thereof shall be of wine, the fourth part of an hin. Lev 23:14 And ye shall eat neither bread, nor parched corn, nor green ears, until the selfsame day that ye have brought an offering unto your Elohim: it shall be a statute for ever throughout your generations in all your dwellings. Lev 23:16 Even unto the morrow after the seventh sabbath shall ye number fifty days; and ye shall offer a new meat offering unto Yahweh. Lev 23:17 Ye shall bring out of your habitations two wave loaves of two tenth deals: they shall be of fine flour; they shall be baken with leaven; they are the firstfruits unto Yahweh. Lev 23:18 And ye shall offer with the bread seven lambs without blemish of the first year, and one young bullock, and two rams: they shall be for a burnt offering unto Yahweh, with their meat offering, and their drink offerings, even an offering made by fire, of sweet savour unto Yahweh. Lev 23:20 And the priest shall wave them with the bread of the firstfruits for a wave offering before Yahweh, with the two lambs: they shall be holy to Yahweh for the priest. Lev 23:22 And when ye reap the harvest of your land, thou shalt not make clean riddance of the corners of thy field when thou reapest, neither shalt thou gather any gleaning of thy harvest: thou shalt leave them unto the poor, and to the stranger: I am Yahweh your Elohim. Lev 23:34 Speak unto the children of Israel, saying, The fifteenth day of this seventh month shall be the feast of tabernacles for seven days unto Yahweh. Lev 23:36 Seven days ye shall offer an offering made by fire unto Yahweh: on the eighth day shall be an holy convocation unto you; and ye shall offer an offering made by fire unto Yahweh: it is a solemn assembly; and ye shall do no servile work therein. Lev 23:38 Beside the sabbaths of Yahweh, and beside your gifts, and beside all your vows, and beside all your freewill offerings, which ye give unto Yahweh. Lev 23:39 Also in the fifteenth day of the seventh month, when ye have gathered in the fruit of the land, ye shall keep a feast unto Yahweh seven days: on the first day shall be a sabbath, and on the eighth day shall be a sabbath. Lev 23:40 And ye shall take you on the first day the boughs of goodly trees, branches of palm trees, and the boughs of thick trees, and willows of the brook; and ye shall rejoice before Yahweh your Elohim seven days. Lev 23:41 And ye shall keep it a feast unto Yahweh seven days in the year. It shall be a statute for ever in your generations: ye shall celebrate it in the seventh month. Lev 23:43 That your generations may know that I made the children of Israel to dwell in booths, when I brought them out of the land of Egypt: I am Yahweh your Elohim. And Moses declared unto the children of Israel the feasts of Yahweh. 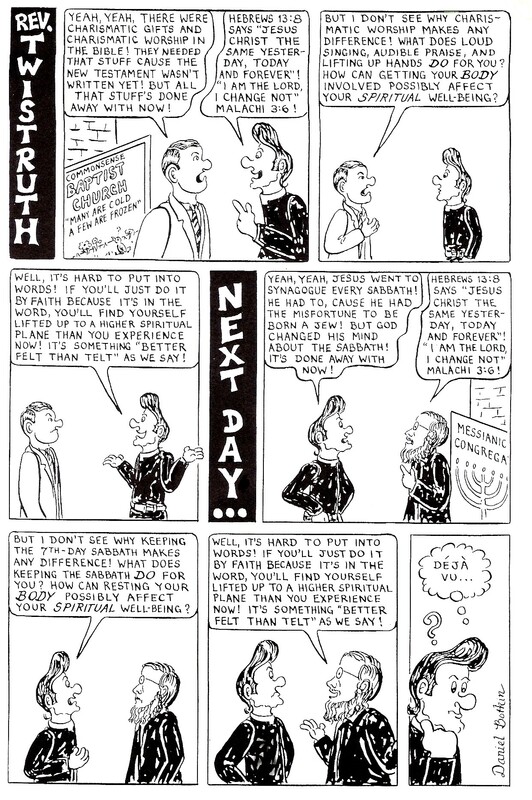 The following comic by Brother Botkin is a good illustration of what we see happening often these days. We find that in a lot of churches, the pastors have fallen into idolatry (creating a God in their own image) and have began to believe in circular reasoning (Yahweh's rules only apply to things they like). The following comic is a good example of circular reasoning. My goal as a pastor is to bring the Scriptures to elementary terms so everyone (including myself) can understand it. I find that pictures, comics, etc. help by providing a visual aid, so I appreciate what Brother Botkin has done by putting these comics together. Comic was reprinted from Gates of Eden, P.O. Box 2257, East Peoria, IL 61611-0257. Write for a sample copy or for information about the Rev. Twistruth comic book. The entire chapter of Leviticus 23 details each of the appointed times of Yahweh. We see many times in the New Testament that Yeshua and his disciples kept the feast as well as the apostles after Yeshua's death and resurrection continued to keep the Feast Days. The Hebrew words used in reference to the Feast days are Kadosh Mikrah which means Divine appointment. Think of it this way, Yahweh has set aside time that He wants to spend with you. You have an appointment with your creator. Will you be there? The above graphic shows the moon's phases animated. The new moon is the first sliver of the reappearing moon.